Renowned for elaborate video installations that draw upon theater and live performance, Catherine Sullivan debuts her most recent film project, The Startled Faction (a sensitivity training), at Metro Pictures. A propositional film concerned with ambiguous labor (uncompensated work outside one’s job description), it features nine characters facing the prevailing question of whether to “lean in” to this ambiguous labor or resist through strategies of withdrawal, redaction and retreat. With varying degrees of aptitude and motivation, the group rehearses symptoms of and methods for avoiding ambiguous labor, including feigned surprise and incompetence, subtle displays of hostility and conspicuous demonstrations of fatigue. They participate in these exercises and in partially reconstructed scenes of resistance drawn from the 1954 film Salt of the Earth, a semi-fictional account of a strike at a New Mexico zinc mine. 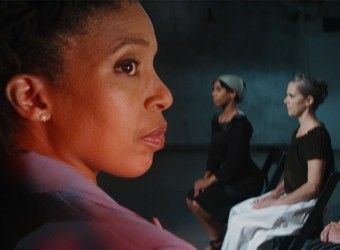 In this film, the lower status and invisibility of the women’s labor is set against the racial and economic urgency of the strike. The nine men and women in Sullivan’s film are drawn into contestation by the soundtrack from Salt of the Earth and a woman attempting to escape from the task of recounting the experiences of that film’s protagonist. The sensitivity training’s modulating mise en scène hosts a wide range of aesthetic treatments, modes of performance and narrative tangents. The group is prompted to find the boundaries of their demands on each other and to redact information when these boundaries are transgressed. Individual motives, awarenesses and psychological and emotional orientations are also implicated in exercises that ask members of the group to identify categorically with circumstances around their race, class and gender. The Startled Faction reflects Sullivan’s concern for and interest in social spaces of redress and divergent artistic and discursive lineages such as left-wing dance from the 1930s, social justice curricula, private testimony and academic sociology. The characters confront the instruments and methods for the expression of complaint, anger and suffering in lived and imagined worlds. Shot in an aspirational anamorphic format, the film allows for new corners and seams to be introduced each time it is installed. At roughly 34 minutes, the film features nine performers working primarily in Chicago, the film’s shooting location. In addition to cinematographer Raoul Germain, some are long-time collaborators in Sullivan’s film and theater works. Work on the piece, which is co-produced with Chicago Dancemakers Forum, began in late 2016. Catherine Sullivan was born in 1968 in Los Angeles and lives and works in Chicago. Her solo exhibitions, collaborations, performances and films have been presented at venues such as the UCLA Armand Hammer Museum, Los Angeles; Walker Art Center, Minneapolis; Renaissance Society at the University of Chicago; Museum of Contemporary Art, Chicago; Whitney Museum of American Art, New York; Secession, Vienna; Tate Modern, London; Opéra de Lyon, France; Volksbühne, Berlin; Cricoteka, Krakow; Trapdoor Theatre, Chicago; Moscow and Gwangju Biennales; Berlin International Film Festival and International Film Festival Rotterdam. Her work is held in public and private collections including Museum of Contemporary Art, Los Angeles; Whitney Museum of American Art, New York; Tate Modern, London; Thyssen-Bornemisza Art Contemporary, Vienna; Rubell Family Foundation, Miami; and Goetz Collection, Munich. Notable awards include the Louis Comfort Tiffany Foundation, Herb Alpert Award in the Arts, Deutscher Akademischer Austauschdienst, United States Artists Walker Fellowship and a Chicago Dancemakers Forum Lab Artist Award. She holds a BFA in acting from California Institute of the Arts and an MFA in post-studio art from Art Center College of Design. She is an associate professor in the Department of Visual Arts at the University of Chicago.